Picture provided to FTM for the Archery Report in 2013/2014 by Heather Hall. FTM file. Last month a deer darted out into traffic on Highland Avenue and crashed into a Saturn, coming through the driver-side window and imprinting a hoof onto the driver's shoulder. The driver was okay, the car, not so much, and the deer sauntered off. 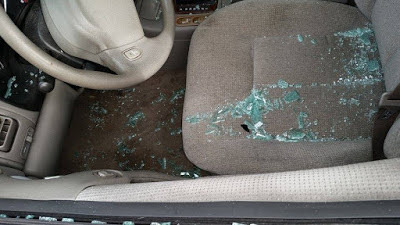 That story was about the kindness of the strangers who attended to the driver of the vehicle. This story is about the fate of the deer and the homeowner whose yard provided the scene of where the deer would take his final breath. Amy Hills, who lives on Sweetbriar Avenue near the initial collision, peered out over her back yard the day after the crash, and saw a deer lying still in her backyard. It ended up being a 200-pound, 4-point buck. "I was walking towards it hollering and before I knew it, I was within ten feet of it before I could tell it was dead. I called the county to ask them what I should do, because I knew the city wouldn't dispose of it. It was one of those situations that you are at a loss because you don't know what to do. I didn't wake up that morning thinking that's what I'd be doing" she said. Multiple calls, Google searches and a day off from work finally led her to a company called Tri-State Wildlife Management. Hills said she first thought of Griffin Industries, which made animal pickup and rendering that part of their core business in the past. "I called them but they don't do it anymore. It's very difficult to find somebody to perform this particular service. I even called someone who picks up animals and cuts them up for meat, but it was in our yard for 12 hours and he was afraid he couldn't use the meat after that amount of time had passed," said Hills. "Dead animal removal is an unappealing aspect of our business, which is why most companies do not attempt this endeavor. We also have techniques and materials to manage odor. 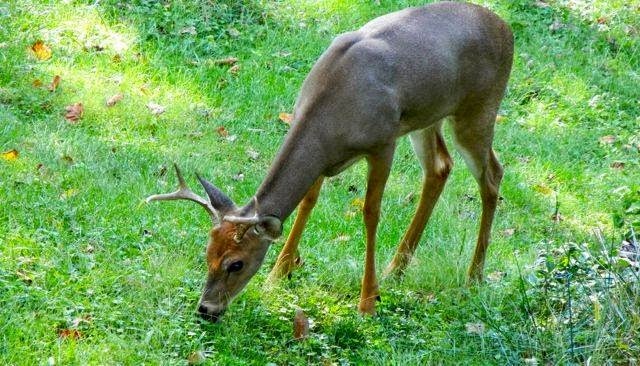 Our most common calls for dead animal removal come from homeowners, businesses and cities who have a dead deer in a yard, parking lot or high traffic area." Hills said the woman she worked with told her she has space on her farm in to dispose of the animals by covering them with quicklime and soil. A man came to her property, rolled the buck onto a tarp and with her neighbor's permission, dragged it downhill and into his truck bed, which was waiting on Edwards Court. Hills said that it cost her $280 for the service. "The guy must have been very strong because he picked that thing up by himself and had two other deer in there as well," she said. "My hope is that if that happens again and someone reads this, they know that it's their responsibility to take care of it and know where to call to get it taken care of." City Administrative Officer, Ron Dill, said that Fort Thomas doesn't have an area to dispose of large animals. "We can dispose of small animals like a possum or raccoon occasionally if it's near a pickup date in our dumpster," he said. "With the larger animals, specifically deer, we have to transport them to one of Rumpke's collection sites. (The city's) costs equal time and gasoline expense." According to the University of Kentucky College of Agriculture, Kentucky has nearly 3 million cattle, swine, and sheep in the state. In addition, there are approximately 2.1 million cats and dogs in Kentucky. With high numbers of animals and a mortality rate of 3 to 5 percent, disposal of animal carcasses can be cause for concern. They say that improper disposal of animal carcasses can contaminate drinking water sources or spread disease. Kentucky state law provides guidance for animal carcass disposal in effort to protect Kentucky’s water resources and its citizens. The cooperative extension service of UK also said that dead animals should be disposed of within 48 hours of death. o Do not bury carcasses in flood plain. public highways, residences, or stables. o Bury in a hole at least four (4) feet deep. o Cut open the abdominal and thoracic cavities along length of carcass. o Cover with two (2) inches of quicklime and at least three (3) feet of soil. This article displays a community issue that the city must take responsibility for, that being the over population of deer in Fort Thomas. It has been published by the city that there are approximately 93 deer in the City. I refuse to believe that based on the number of accidents and incidents of deer destroying property in the community. It is my opinion that there are much more than 93 deer in the city and the administration should address this problem as it continues to grow worse each year! What will it take for them to do something about this issue.......hopefully not someone getting seriously hurt. It is bad enough that we have to continue to put up deer fencing and 'fight the deer off' each spring thru fall to have a nice yard.....just a few years ago this was not the case.......So please address this before it becomes even a bigger issue! According to their website date 3/11/16, Tri-State does perform this service. I found a dead deer on my property this morning and put a call into them for removal. We'll see what happens.